Champney Falls is a gorgeous waterfall located in the White Mountains of NH. It is easily accessed off of Route 112, the Kancamagus Highway. It is perfect for all hiking levels, and accessible in all season. The falls are often combined with a trip up Mount Chocorua. The trailhead is easily recognizable with a parking lot and sign off of Route 112, the Kancamagus Highway. From Route 16, follow route 12 for 14 miles. The trailhead will be on your left with a noticeable parking lot. From I-93 you will have to travel across most of the Kanc to make your way to the trailhead. There is a parking fee of $5, like all other trailheads in the Whites. The trail to Champney falls is 1.4 miles of very gradual elevation gain. This trail is great in all four seasons, for all age levels, and all hiking levels. Walking along Champney brook makes the entirety of the short hike very pleasing. Keep in mind that this is a popular trail, the parking lot can fill, and many people may be on the trail in peak months. Once you reach the base of the falls, you can turn left to get a better view of all of the falls and the very cool rock formations created in the small gorge. You can also continue up nicely made steps to the upper falls which contains a pool of water, and cascading falls. Mount Chocorua can be accessed from this trailhead or others. The Champney Falls trail offers gorgeous views as you walk past Champney Falls to Chocorua. Round trip around 8.4 miles with about 2,300 feet of elevation gain. It is accessed from the Kancamagus highway. It is only shortly after the Rocky Gorge Scenic area coming from Route 16. There is a good sized parking lot at the trailhead. Love waterfalls? 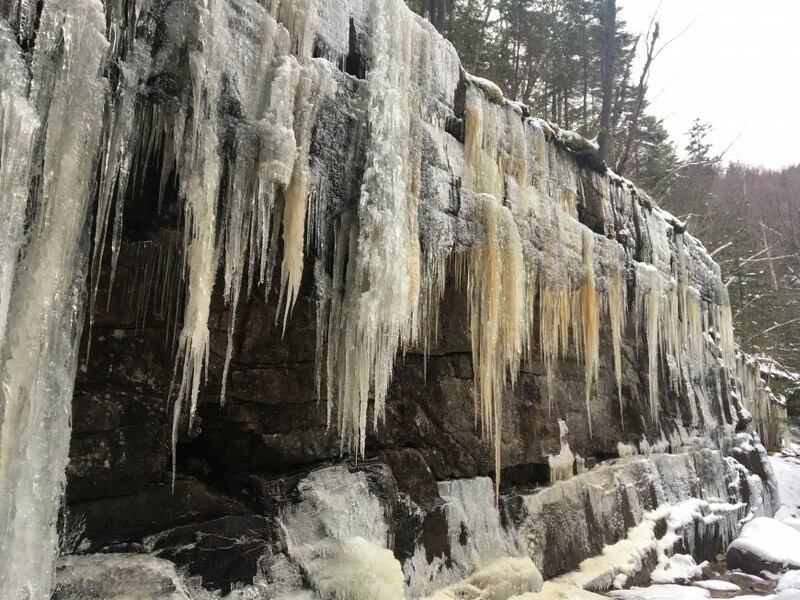 Check out Arethusa and Ripley falls in Crawford Notch!